This is another one of those recipes that I don't really know where it comes from but I keep cooking. It might be something I've found in cookbook or a magazine, or even something I've tried to recreate from restaurant meal somewhere. Never mind, it's nice and I like it. As you can see there are not many ingredients to it and I prefer to keep it that way. If you want to freestyle it, go ahead - adding stuff like green peas etc would work really well. It doesn't have any real spice added so use some nice chili sauce like Sriracha to kick it once you got it in front of you. As the title says, it's supposed to be a bit crispy. Looking at the packaging for the pork mince I bought I saw that the recommended cooking method and time was to pan fry it for 40 minutes. Yes, you read that right. 40 minutes. They must be a) on drugs, b) mental, c) very afraid of lawsuits or d) all of the above. Enough bitching about stupid labelling, let's have a look at the recipe. Heat the olive oil in a frying pan on a medium to high heat. Add the mince and fry until it starts to change colour, add the garlic and spring onions. Keep frying until all liquid has evaporated and the mince starts to brown up. Add the soy sauce and honey and keep frying whilst stirring all the time. Let the liquids cook in and allow the mince to crisp up properly. In the meantime, cook the noodles according to the packaging. 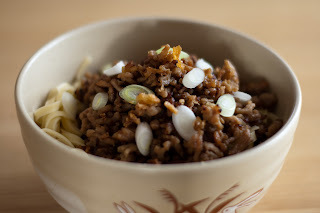 Once the mince is crispy enough for your liking, serve it on top of the noodles. Top with some spring onions slices and crispy onions. Even my daughter liked it! That's great! I get really happy when I hear that people have tried recipes from here and liked them. Added bonus with your daughter liking it too. I hope you'll find more stuff here to try in future. You are more than welcome! It's always nice when people like what I post here. I hope you'll find some more recipes here, either now or in future, that you'll like. this recipe is awesome i have cooked this so many times now! i add water chestnuts and tonight am going to try it with mushrooms everyone loves this one! thanks! They are a bit different, but if you like a slightly sharper flavour I can't see why you couldn't swap. The spring onion are normally a bit softer and have a milder flavour. Having said that - I normally put diced 'cooking' onion onto tacos so I am with you on this one.